I've seen a number of extraordinary paper dresses: showing Warhol's Campbell's Soup print, for example, and another touting Nixon for President. But this one tops them all. Isn't it ironic that dresses like these, meant to be the ultimate in disposable fashion, wind up becoming objects to preserve at all cost . 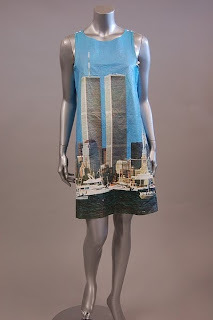 . .
(WTC paper dress, Lot No. 1372, to be auctioned tomorrow, October 26th by Kerry Taylor Auctions, London. If you're interested, get in touch with them here, right now). ¿Me permitís invitaros a que visitéis mi blog www.fashionhorrors@hotmail.com?. Espero que os guste. Muchas gracias!! !